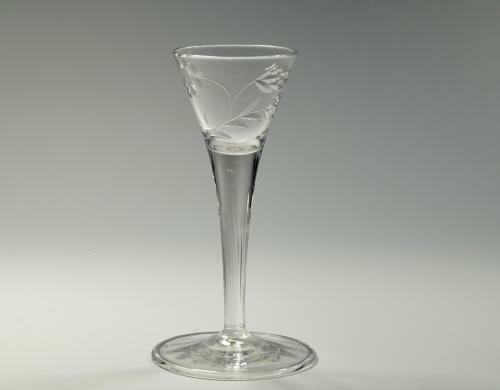 Drawn trumpet liqueur glass with stylised rose pattern decoration reeded stem and folded foot with optical ribbing. Designed by Harry Powell and made by James Powell & Sons London C1910. Condition: Very good with chips, cracks or evidence of restoration. Glasses from this service are illustrated in Whitefriars Glass 'The Art of James Powell & Sons' Edited by Lesley Jackson 1996. p.109, plate 53.